La MaKina is setting his sights on Cooperstown. New Twins beat writer Do-Hyoung Park had a chance to catch up with Jose Berrios and ask about his goals. The entire interview is available on MLB.com. Berrios responded by starting out with your sort of canned athlete answer of it’s a new year and I just want to get better everyday, stuff like that. But then he got into specifics and it got very exciting. Alright! I’m already getting excited. Then Park asked Jose about establishing himself as an ace and how his mentality has changed since he was a rookie. “My mindset and my attitude to work everyday is the same. I want to be the best,” Berrios said. “I want to be in the Hall of Fame someday,” Berrios said. POW! How awesome is that!? I don’t recall ever hearing a player throw that out as one of his goals, let alone a guy who’s only 24-years-old. I love it! When we talk about leadership, this is true in baseball as well as other aspects of life, we typically are looking toward figures of authority or elders. That’s a relative term. You wouldn’t typically call a 38-year-old an elder, but in baseball terms I think that label fits for Nelson Cruz. 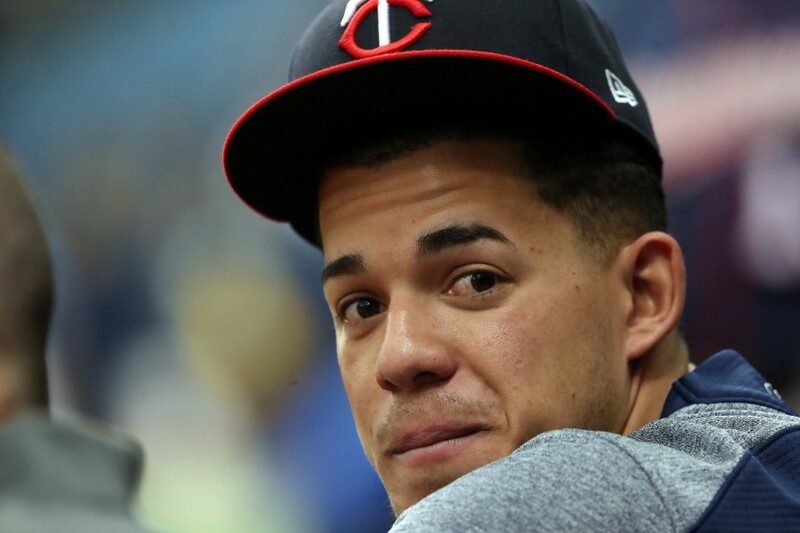 Anyway, with his energy, work ethic and optimism, I see no reason to think Jose Berrios can’t be the leader of the Twins pitching staff for years to come. Of course, there is no substitute for experience, but Berrios is entering this season with 71 starts under his belt. By no means has he seen it all, but it’s also not like it’s his first rodeo, either. And some of the young guys are already looking up to him. Brusdar Graterol has started referring to himself as The Machine Jr. That’s awesome. "My focus is to work out every day—every day. I need to keep my arm strong; that's the most important thing. So, every day I work on my arm. I like working hard. That's why Jose Berrios is my favorite. I understand he works every day." "Every day I watch video of Berrios. That helps me improve. Right now, I'm working on my changeup." Someday soon there may be two members of the Minnesota Twins rotation trying to pitch themselves to Cooperstown. Am I getting ahead of myself? Of course I am, but can you blame me? Listen to these guys. You gotta love it. Twins Chief Baseball Officer Derek Falvey joined Chad Hartman on WCCO Thursday to preview TwinsFest. Here’s a link to where you can listen to the entire segment. Falvey joins the broadcast at about the seven-minute mark. Hartman asked about all the one-year deals they’ve been signing and why the team is so willing to go there when things went so poorly with similar deals last season. Falvey said the difference as the players they signed late heading into 2018 were all seeking multi-year deals, whereas the guys they’ve added this year were comfortable and saw some value in signing one-year deals. He said he views them very differently in terms of player desire and interest. Hartman acknowledge that he saw a lot of potential for the lineup to be good, but expressed concerns about the current pitching staff. He asked if Falvey believes whether or not the pitching staff as it’s currently constructed can play meaningful games in September. To his credit, Falvey didn’t side step the question, beginning his answer with “I do, and here’s why.” He went on to point out all the seemingly unorthodox ways some really good bullpens have been built of late, and specifically mentioned the 2018 Oakland Athletics. In regard to the closer role, he added that the Twins have five relievers who have closed out games at the big league level. How about those 2018 A’s? Blake Treinen went from basically your average reliever in terms of production to arguably the most dominant pitcher in baseball. Yusmeiro Petit was sort of the equivalent to a bullpen innings eater, pitching an effective 93 innings, which had to go a long way to keeping everybody else fresh. Rookie Lou Trivino burst onto the scene, Emilio Pagan was death to right-handed hitters and Ryan Buchter was untouchable against lefties. That foundation of those five pitchers ended up blending to be a deadly bullpen. Nobody could have seen things shaking out the way they did, but everything seemed to magically fall into place for Oakland. They added to that group around the trade deadline and went on to win 97 games last season. I don’t love the idea of the Twins depending on some of that magic finding their way, but if you wanted to point out an unorthodox way an excellent bullpen was built, I think Falvey nailed it with the 2018 A’s. “Don’t always believe everything you read on the Internet,” Falvey said. Ohmigod, is Berrios demanding a trade?? Don't understand why they aren't trying to sign Berrios to an extension. This seems like the offseason to do it. You aren't going to find many better young pitchers with less injury risk. Even if they are trying to extend him, Berrios is talented enough and young enough to bet on himself. IMO the Front Office hasn't done enough to prove to our younger players they are committed to winning. They seem to be more committed to finding value and saving money. It's likely a key reason players choose NY over mid-market teams. Yeah, history and market play a role in the decision. But if I'm a young, talented player on the brink of free agency, and I continue to see a team pay for the most talented players year in and year out, chances are they will move up on my list of teams I want to be part of. If I were in charge, I'd hand him a standard contract with the years and dollars blank and ask him to fill it out to his liking and return it by the end of the day. I remember Berrios in a post game interview after his first career win, and basically saying "only 299 more to go". Kudos to Chad for asking the right questions.But I totally disagree with the writer on his take that Falvey didn't side step his questions.I think it is the FO's job to make this team better than last year.We lost pieces and we added pieces but it is highly debatable that this team is better than the one that started the season last year which ended in a player dump.Our bullpen was poor on paper last year and is even poorer on paper this year.No closer? While I won't miss Rodney, I guess I would prefer to make an attempt to sign someone reasonable.I understand that the FO is waiting for our core to reach the next level before we go all in but, what that means to the fan base is a middling team at best unless Sano, Buxton and Kepler take the next step forward without regression from Rosario and Polanco.What scares me is that these guys good make good progress and we lose a bunch of games because of our pitching staff. Over two months to go until opening day, guys.Lots of time to get one or two of these players extended....Berrios, Gibson, Rosario.Will I be disappointed if no one gets extended, yes.Do I think it will be a mistake for the Twins, yes.Will that disappointment change my excitement for this team, no. Damn, I wish I could be going to south Florida next week. We might not like his answers, but I don't think we can accuse him of being ambiguous. One of the better interviews I think I've heard in terms of questions which require real answers. Very un-Sid like. Apparently, the apple fell off the tree and rolled some distance away. I guess I see it very differently. He does not agree with you. Or me. But he didn't sidestep the questions. Pfff bwahahahaha, Good one jimbo, I needed a laugh. Even if they are trying to extend him, Berrios is talented enough and young enough to bet on himself. I'd bet this is a big factor in any potential extension talks. Berrios clearly believes his best days are ahead of him, so there doesn't seem like there'd be any motivation on his end to sign what would be a team-friendly deal at this point. We might not like his answers, but I don't think we can accuse him of being ambiguous. One of the better interviews I think I've heard in terms of questions which require real answers. I felt the same way. I don't agree with this mentality of "all these things could happen" that he's pushing. Sure they could, there are a lot of high-ceiling guys on this roster, but I'd still like to see some more work done to raise the floor of this team. Any of those things that could happen should just be a bonus to what you've already built up. Falvey and Levine are both incredibly good at what I'd call being slippery. They're both very skilled in answering direct questions in sly, indirect ways. I'm not knocking them, that seems to be a valuable skill for a front office these days. I felt like Falvey didn't do as much of that sliding around in this interview, and to me it sounded like he got a little fired up, relatively speaking. There was definitely some more conviction in his voice than I've heard in most other interviews. It's pretty rare to extend a player before their arbitration years begin. I'm ok not "Fixating" on the payroll number as Falvey mentioned. Production is production and there are plenty of examples of minimum salary producing and high salaried players not producing. Finding players that produce is the job that they are tasked with and this is what I have been and will be razor focused on and I don't care where they come from or how much water they draw out of the payroll well. So yeah... I'm absolutly OK not "Fixating" on the payroll number as Falvey mentioned. However... that potential fixation is a two-way street. If Derek Falvey is going to ask us to join him and not fixate on the payroll number... then they can't fixate on it either. MEANING: If you are paying a guy 6 million dollars and he is failing. Don't fixate on the 6 million you spent by keeping bad performance in the lineup everyday. That is a form of fixation of the payroll number. A failing player in the lineup is a mistake, continuing to play that failing player is a 2nd mistake that synergizes with the first mistake and is much much worse than the original mistake. So Derek, I personally promise to you that I will not fixate on the payroll number and I ask you to promise to not fixate on it either. In 2019 and going forward, don't take as long as you did to discover Astudillo or Cave in 2018. The amount of time you took to find those players is a form of fixating on the payroll. I've heard you a couple of times clarify an original comment about one year contracts being a lesson learned from last year, by adding the lateness of the signing to the context. Bottom Line: It doesn't matter what the reason was or what the lesson learned was. It's wonderful that you found the reason for the poor performance... if you did? However... the question that needs to be answered is: You recognized the poor performance... why did you steadfastly stick with it? It's like standing in the rain in your backyard, instead of going into the house. You have the option of going indoors at any time but you just stand in the rain until it ends. The next day you say to your wife. "I figured it out... the reason I got so wet yesterday was because it was raining". Your wife is going to say: You are right, but why didn't you come inside". Of all the ways I anticipated this sentence being completed - such as "make a run at winning the division" - a reference to "flexibility moving forward" didn't rank very high. I'm not asking him to make a brash prediction that he'll be hung for later. But with all the qualifiers he stated... this is deflating. I'm not interested in the front office's flexibility. He's not the star of the show. I watch the games in hopes of competitive baseball. He begins his reply with a focus on "this... group" of players but then pivots back to the FO. If he's not willing to characterize the year as rebuilding, but his aspirations aren't on winning... then, uh, what? "Sights set on Cleveland" as an afterthought later on didn't do it for me. He's not very inspiring. "Twins Baseball: come for the young prospects, stay for the flexibility moving forward!" Of all the ways I anticipated this sentence being completed, such as "make a run at winning the division", a reference to "flexibility moving forward" didn't rank very high. He's not the star of the show. I watch the games in hopes of competitive baseball.He begins his reply with a focus on "this... group" but then pivots back to the FO. I read the same thing and had the same reaction. I'm a fan; I wanted to read the spin there. Now I wonder if the converse of that statement isn't also true: if things don't come together this year, will ownership provide even less "flexibility" in 2020? Corporate-speak like he engaged in suggests to me that he can't say what he's actually thinking. I love Berrios and his enthusiasm - you can see it when he pitches. The FO has not won me over.After the first year I was told that they did not have their guys in place, just wait.The second year they were putting their guys in place and now many of their guys like Pickler and Garvin are not around any more so we made more adjustments.Now they have their guys, they have available funds, and they have gone for flexibility.I am still not in line with them, not even a little bit at this point. I disagree with the questions being great. Is 2019 a rebuilding year?We addressed many of the holes in the lineup.We haven't entertained the idea of selling any of the many expiring contracts we have.We obviously view 2019 as a competitive year.A better question would have been something like "why aren't we going 'all in' or when can we expect to be more aggressive? "Nothing we have done suggests "rebuild." Because our payroll decreased doesn't mean our talent level did. Why all the 1 year contracts after we saw so many free agent flops last year? I don't understand, you are worried about free agents flopping but also wondering why we only sign short deals? Is the pitching staff good enough to play meaningful games in Sept?Change Sept to October and its a great question.I think the rotation is a little better than last year by having Pineda.Add in Parker, a full season of May, and the plan to use our young guys like Mejia, Romero, etc. as relievers should help the bullpen.This could be a decent group.I would answer yes confidently to are they good enough to "play meaningful games in Sept" but I don't know how confident I would be in the pitching staff if we made it to October.My idea of "meaningful games in Sept" would include being 5-7 games behind Cleveland or the 2nd wildcard which is a reasonable expectation.Compared to a typical playoff team though, it is an underwhelming group. "If he's not willing to characterize the year as rebuilding, but his sights aren't on winning... then, uh, what?" Then, business as normal with Twins management. The aim is to be "competitive" enough to produce decent ticket sales while banking the profits. They may set winning the division as a goal, provided the rest of the division is taking a few years off. Is 2019 a rebuilding year? We addressed many of the holes in the lineup. We haven't entertained the idea of selling any of the many expiring contracts we have. We obviously view 2019 as a competitive year. A better question would have been something like "why aren't we going 'all in' or when can we expect to be more aggressive?" Nothing we have done suggests "rebuild." Because our payroll decreased doesn't mean our talent level did. Is the pitching staff good enough to play meaningful games in Sept? Change Sept to October and its a great question. I think the rotation is a little better than last year by having Pineda. Add in Parker, a full season of May, and the plan to use our young guys like Mejia, Romero, etc. as relievers should help the bullpen. This could be a decent group. I would answer yes confidently to are they good enough to "play meaningful games in Sept" but I don't know how confident I would be in the pitching staff if we made it to October. My idea of "meaningful games in Sept" would include being 5-7 games behind Cleveland or the 2nd wildcard which is a reasonable expectation. Compared to a typical playoff team though, it is an underwhelming group. 1) I'm not sure I agree that they obviously view 2019 as a contending year. In fact, 1 year, bounce back type contracts are exactly the type of deals I'd look for were I rebuilding. They can be turned into long term assets if they bounce back, but don't block internal options with long term commitments if they don't. 2) He's worried about them flopping BECAUSE they are on 1 year deals, as the FO hypothesized as much regarding Morrison and Lynn. So I don't see any contradiction there. 3) Mostly fair, though different people vary on their definition of meaningful games. It's not impossible to make up 5-7 games in September, but I'd venture to guess it's quite a long shot. If they are 7 games back, with say 20 to go, I won't consider those last 20 games meaningful. Others may fairly disagree. Who is a bounce back candidate besides Schoop?Cron isn't, he was good last year.Parker isn't, he was also good last year.2018 Schoop is also better than what we got from 2B in 2018.With Tyler Austin and Jake Cave looking for at bats we signed one of the best hitters available in Nelson Cruz.That doesn't signify a rebuild. Its not a rebuild when you just have good cost effective players like Garver, Kepler, Berrios, Rosario etc. Why would they flop because they ARE 1 year deals?I don't understand the logic there.If anything they should be motivated to play for a longer deal next time through the market.I don't think its fair to say Morrison or Lynn would have had a good years had they gotten 3 year deals.Especially when Morrison complained of a hip injury and Lynn had a short spring training and a move to AL as much better excuses.Plus the FO points out how vastly different this years signings are.Parker, Cron, Schoop, and even Perez signed early, nothing about these signing was lack of interest or forced to take a deal under their perceived value. Who is a bounce back candidate besides Schoop? Cron isn't, he was good last year. Parker isn't, he was also good last year. 2018 Schoop is also better than what we got from 2B in 2018. With Tyler Austin and Jake Cave looking for at bats we signed one of the best hitters available in Nelson Cruz. That doesn't signify a rebuild. Its not a rebuild when you just have good cost effective players like Garver, Kepler, Berrios, Rosario etc. Why would they flop because they ARE 1 year deals? I don't understand the logic there. If anything they should be motivated to play for a longer deal next time through the market. I don't think its fair to say Morrison or Lynn would have had a good years had they gotten 3 year deals. Especially when Morrison complained of a hip injury and Lynn had a short spring training and a move to AL as much better excuses. I don't know. Ask the FO, as they are the ones who floated the idea that guys being disappointed with 1 year deals caused their subpar performance. Them saying that, and then continuing to sign 1 year deals, makes it a very legitimate question, which Falvey addresses in the interview. Falvey for sure side-stepped. when asked about the pitching staff he literally skipped over the rotation. Then he raised the A's random gold strike as their plan? That's pretty unlikely. BUT if it were to work, you'd need someone to develope into an untouchable K machine. We have no one that could develop into that. The closest we had was Ryan Pressly who was still under contact and probably extendable. Instead we traded him. A strange move if our plan was to develop a Bull Pen first pitching staff. So they either have no plan, have switched plans and set us back, or are lying about the plan. I think it's 3. Why would they tell fans and media they're not trying to win? I'm not endorsing the "pounce when the timing is right" strategy, but I read this to suggest they'll have the flexibility to add a missing piece or two if the other things are in place and they're contending. It was not a comment in my view that indicates a low aspiration about contending in 2019. But you could be right, he could indeed be thinking mainly about finances, and I get why most people think that. You're all wrong. I'm right. Those 4 won't flop because they are one year deals. The front office thinks they might flop because they are marginal players to start with. That is why he is talking like that IMO. He knows those 4 are scrap heapers and may be decent, or may be terrible.